When working with layers in Photoshop Elements, you may find the need to transform (scale or rotate) some of your images. You can do so by applying the Transform and Free Transform commands. The methods to transform layers and transform selections are identical. The Image–>Transform menu in Photoshop Elements. A bounding box surrounds the contents of your layer. Drag a corner handle to size the contents. Press Shift while dragging to constrain the proportions. To rotate the contents, move the mouse cursor just outside a corner handle until it turns into a curved arrow and then drag. 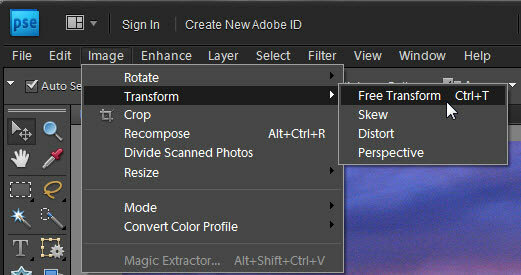 To distort, skew, or apply perspective to the contents, right-click and choose the desired command from the context menu. You can also click the rotate, scale, and skew icons in the Options bar, as well as enter your transform values numerically in the fields. Try to perform all your transformations in one execution. Each time you transform pixels, you put your image through the interpolation process (analyzing the colors of the original pixels and “manufacturing” new ones). Done to the extreme, this process can degrade the quality of your image. This is why it’s prudent to use the Free Transform command, rather than individual commands — so that all transformations can be executed in one fell swoop. When the Move tool is active, you can transform a layer without choosing a command. Select the Show Bounding Box option on the Options bar. This option surrounds the layer, or selection, with a box that has handles. Drag the handles to transform the layer or selection.